This page will explain struts 2 and quartz 2 scheduler integration example. With the help of ServletContextListener we can use quartz with struts 2. Struts 2 does not provide any specific plugin to integrate quartz scheduler. We implement a listener using ServletContextListener and write quartz code in contextInitialized() method. On server startup, scheduler is started. In our example we have created a simple job and to schedule it, we are using CronTrigger that will accept the given cron-expression. To develop the example, we are using software and tools as follows. 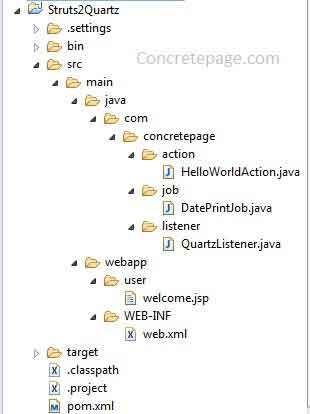 Find the maven dependencies for struts 2 and quartz jar. We are creating our job implementing quartz Job and overriding execute() method. We are creating a listener compatible to servlet 3 using @WebListener. Our listener is implementing ServletContextListener. This listener will be started on server startup. Inside the contextInitialized() method, we write code for quartz scheduler as usual using quartz API. In our example CronTrigger is being used which needs cron-expression to schedule the job. Build the project and create WAR using Maven and deploy it. On server startup, our QuartzListener will start and schedule the DatePrintJob. Job will run every after 1 minute.